We've been delivering in-school dental care since 1999. Our company thrives on providing quality dental services for children who may not regularly see a dentist and are eligible for public aid. We proudly offer free dental exams for non-eligible children. All children are eligible, kindergarten through high school. State of Illinois medical card and even those eligible for grant coverage. All children can receive care when a consent form has been filled out. Our new electronic form makes the process even easier. We carefully protect all medical information by complying with all HIPPA regulation. Our program is FREE to your school and available to ALL children. We print and distribute permission slips to ALL children. All children receive a dental exam. Children who are eligible receive a prophy treatment, fluoride varnish and sealants (as needed). Our staff completes a state dental exam form for all children and leaves it with the nurse or secretary at the end of the day. All children are given a form to take home explaining what services were complete, including recommendations for further care (as needed). Parents and guardians are notified if a child needs to be taken to a dentist, we gladly recommend area dentists. All children receive a toothbrush. What kind of toothpaste is best? Is my child getting enough flouride? What about sealants and flossing? Knowing the answers to these questions can help you keep your kids' teeth healthy and cavity free. 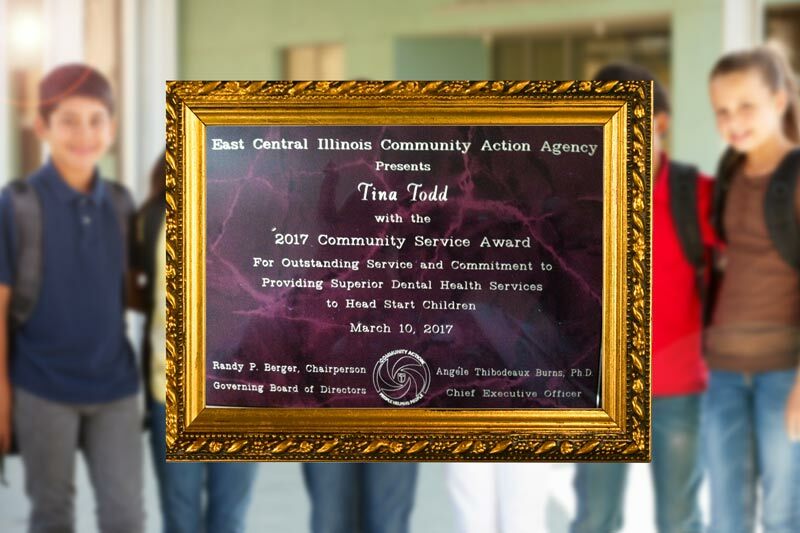 We're proud to announce: Tina Todd, of Orland Park Dental Services, recently recieved a well deserved community service award for her dedication to youth dental health. The Chicago Dental Society offers tips to parents for taking care of children's teeth -- at any age! A child's dental care begins before birth. Read on for advice that will help ensure a lifetime of healthy smiles for your child.